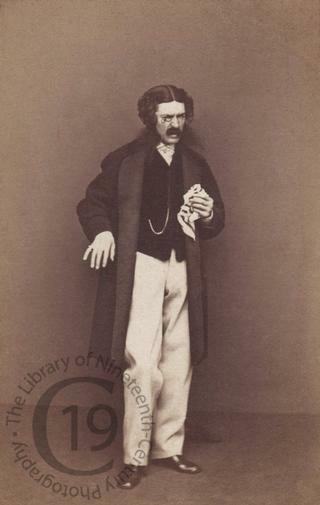 A carte-de-visite portrait of the English actor Edward Askew Sothern (1826-1881), seen here as Lord Dundreary, a character he created in 1858 in Tom Taylor’s comedy Our American Cousin. The role was originally so small that Sothern considered turning it down, fearing it might damage his reputation, but was persuaded to accept it by his friend and fellow cast member Joseph Jefferson, supposedly with the now famous line: ‘There are no small parts, only small actors.’ The play premiered in New York on 15 October 1858 at Laura Keane’s Theatre. After two unhappy weeks portraying the good-natured but weak-minded aristocrat, Sothern began ad-libbing, adding gags and business that proved so popular with the public that Dundreary eventually became the central character of the play, and Sothern’s most famous role. His character’s name gave rise to two eponyms: long, bushy sideburns as sported by Lord Dundreary became known as Dundrearies, or sometimes Dundreary whiskers, and his many twisted and nonsensical aphorisms, for example ‘birds of a feather gather no moss,’ became known as Dundrearyisms. The play’s most famous scene involved the lisping, brainless nobleman reading a letter from his even sillier ‘bwother’ Sam. Of course, such success spawned numerous spin-offs, most notably a sequel by Charles Gayler and another by HJ Byron. In 1862, and again in an 1865 revival, Sothern scored a lesser hit as Sam Slingsby in John Oxenford's Brother Sam, a play about Dundreary's brother. Today, Our American Cousin is best remembered as the play Abraham Lincoln was watching when he was assassinated. Photographed by Alexander Bassano of London.